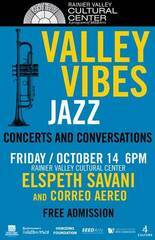 Valley Vibes Concert and Conversation features two outstanding regional jazz groups led by women musicians on Friday, October 14 at 7pm. Correo Aéreo will open the concert, followed by headliner Elspeth Savani. We'll hold the concert at the Rainier Valley Cultural Center as a free event (donations welcome). Following the concert, we invite audiences to join the artists in a conversation (topic: Women in Jazz; Breaking the Glass Ceiling) with a wine and hors d'oeuvres reception. Elspeth Savani blends a bit of contemporary pop and modern jazz in her vocal style. For more than a decade, Savani has directed and performed with Orchestra Zarabanda, a modern 10-piece band evocative of Old Havana. She’s a Wesleyan music grad, specializing in West African drumming and South Indian vocal music. She’s recently released Flights of Mind-Pensamientos en Vuelo as a bandleader. Savani is joined by Julio Jauregui, piano; Jeff Norwood, bass; Jeff Busch, drum set/percussion; and Stuart MacDonald, tenor saxophone. Correo Aéreo (Air Mail) is a world music duo performing traditional music of Venezuela, Mexico and Argentina. Madeleine Sosin and Abel Rocha combine their vocal and instrumental mastery for a journey into acoustic traditional song. They’re Austin Music Award winners, performed at South By Southwest’s (SXSW) first World Music Showdown, and have been featured in documentary films, PBS television and on NPR Radio. Correo Aéreo tours nationally and internationally and appears regularly in Seattle, where the duo is now based. Madeleine Sosin plays violin, maracas, bombo, jarana, quijada, and sings. Abel Rocha plays Venezuelan and Mexican harp, guitar, cuatro, quinta and vocals. The concert is followed by a public discussion with the artists. Appetizers provided by Tutta Bella Neopolitan Pizzeria. 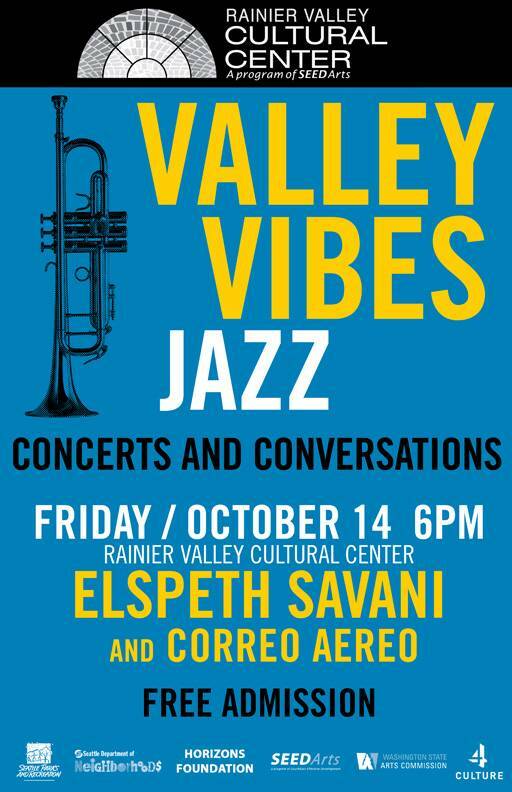 Stay tuned for the next Valley Vibes Jazz event The Legacy Quartet with Clarence Acox and the Katy Bourne Trio, November 11, at the Rainier Valley Cultural Center.